An ambitious training academy led by an Redditch business outsourcing firm has been honoured by a Midlands college. Around 425 people have found full-time jobs with Prospect Hill-based Sigma Group after receiving expert training in the academy set up by Sigma – in partnership with Birmingham City Council, the Department for Work and Pensions and Birmingham Metropolitan College (BMet). 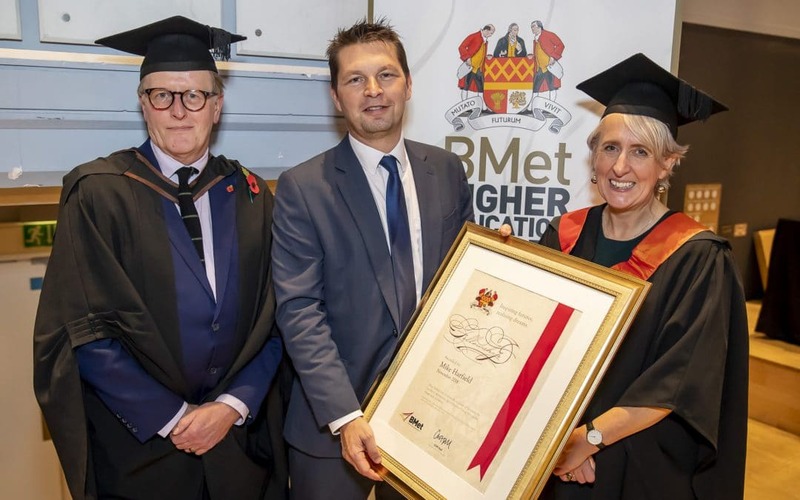 Now, in recognition of the company’s success and long-term commitment to employment opportunities and skills, Sigma’s Chief Operating Officer Mike Harfield has been made a fellow of BMet. Mr Harfield said: “We have an absolutely outstanding team providing a first-class programme that builds candidates’ confidence and makes them ready for a career in our business. “The team has taken hundreds of people and given them rare, hands on opportunities in a professional workplace. Sigma has seen its staff numbers grow to over 1,000 since being acquired by South African-based Digicall Group in 2016. Sigma’s clients include major blue chip organisations from the utilities, financial services, retail and telecommunications industries. The company was formed by Mr Harfield and CEO Gary Gilburd in 2011.